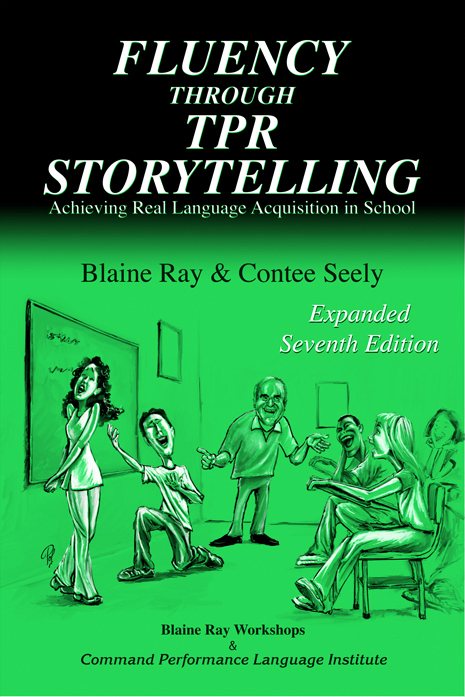 Hieronder vind je het verhaal van Blaine Ray, ‘the inventor of TPRS’. In Nederland en België kun je voor trainingen, studiedagen, workshops en materiaal over TPRS en TPR terecht bij Taalleermethoden.nl. 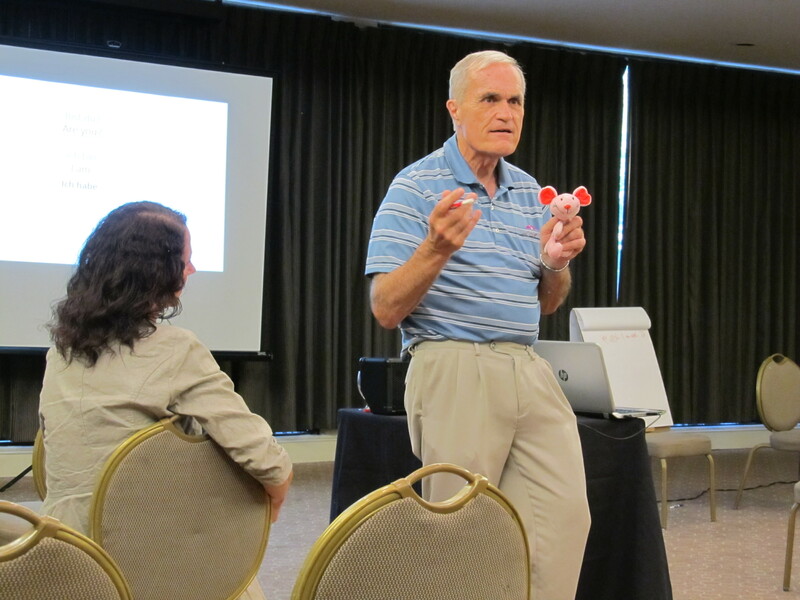 Wednesday I first went to the advanced workshop by Blaine & Von Ray: The power of going deep. This year the advanced workshops were from 8.30 -11.30, then a break of two hours and then the workshops continue for two more hours from 1.30-3.30 p.m. Then a short break of a quarter of an hour and then sessions from 3.45-5.15 or open coaching & exhibitors. Then a break of a quarter of an hour and then showcases by masterteachers, like Blaine Ray, Michael Miller, Mira Canion, Laruie Clarcq, Bryce Hedstrom, Karen Rowan and Jason Fritze. In The power of going deep we had to work in small groups and work out ideas for stories. Blaine stressed again how imporatn it is to try to find out where the students break down through: hesitancy, comprehension, lack of confidence. During lunchtime = Wholefoods time; we go there with a small group of TPRS-teachers (only female…). It’s nice to have such a long brak in between, to having some time for yourself, to go outside in the sun, to talk to each other. In the afternoon I went to the sesson by Bryan Kandel “Student-driven Curriculum”. Here you can find his slideshow as pdf. It was in fact all about PQA. His image of a little devil whispering bad things about his deficiencies in his ears and a little saint (Blaine) giving him positive advice was very funny. In the evening were the immersion dinners, but somehow I did miss where the French teachers would meet and when I returned from Mira’s session and dropping my things in my room, everybody had gone. So I decided to walk to Wholefoods, along a busy street with lot’s of cars because it was rush hour. On my way I met one of the Turkey’s military language teachers who was already going back and on my way back when it was already getting dark, Betsy Paskvan was walking behind me – at first I did not recogize her and I thought “Why is this woman walking faster and faster towards me?” . She also happened to have been at Wholefoods and we went back walking & talking and like this time flew and we arrived at the hotel when it had become dark. My roommate and French teacher Michele Kindt returned very late and I heard from her that the French teachers went to a restaurant in Naperville, where they had been singing all evening and that the aother guests had also been singing, so they had a great French evening. What a pity I missed it all! Today I went to the advanced workshop by Betsy Paskvan: TPRS Strategies. She learned us Japanes and this way she showed us all kind of strategies she uses. 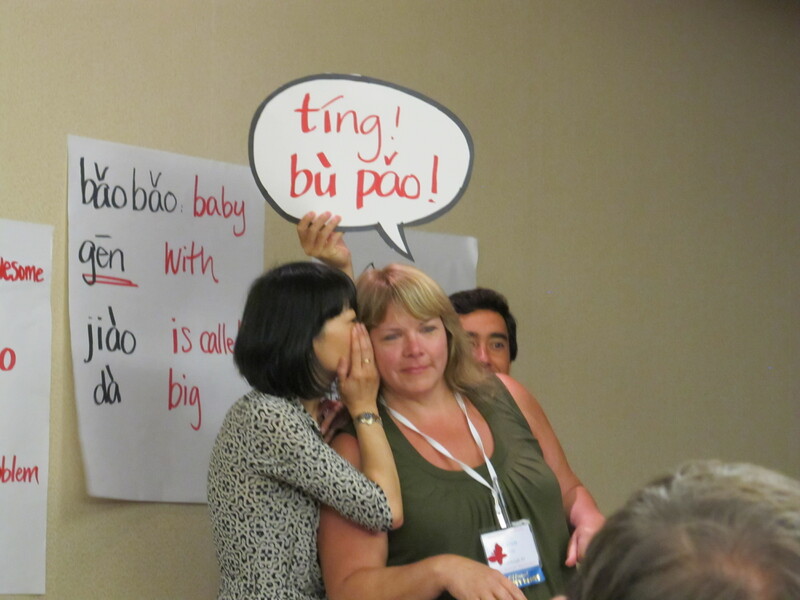 Bess Hales wrote about it at her blog “Mme Hayles and the TPRS Experiment” and it’s a very good description of the workshop and I do not have much to adjust to it, so do read it here. What I have to adjust is that Betsy uses 8 embedded readings and this way she builds the text gradually up. Betsy sacrifices language time for the social-emotional learning – in order that the students get to know each other & bond. The first thing Betsy does in the morning is play a song and show a slideshow with explanation with pictures. With us she used a very well known song and gave cultural information about it. 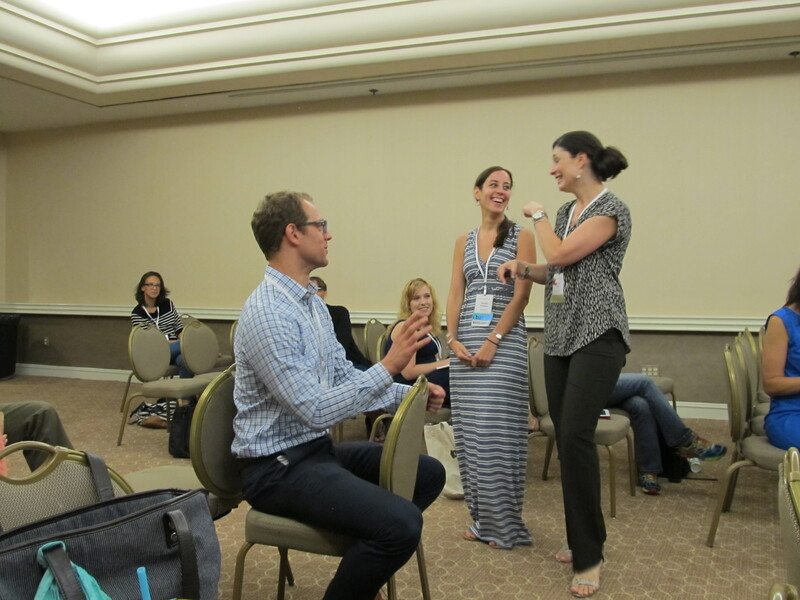 In the afternoon I went to Jason Fritze’s workshop session: Tools for thriving. Because Bryce had written on the white board with an unerasable marker, Jason learned one of the first person’s entering how to erase it with an erasable marker by writing over the unerasable text and then it was possible to erase. And this person had to learn to a new person entering who did not know this trick how to do it and so forth, like an erasing chain. Jason’s workshop had a few of the same points of his workshop at iFLT, but also a lot of new information. He had us form groups of three or four and made us do all kind of group works every once and a while and before doing this he had us point at all the participants of the group. When I met the two ladies of my group the next day I felt that we really were somehow closer because of this pointing and working together. At the end of the afternoon was the exhibitor’s reception. Everybody could have a look at the books and dvd’s and buy them and there was a buffet and drinks. There Judy Dubois introduced me to Alparslan, the french teacher of the Turkish delegation. We contacted each other a while ago on Linkedin, but we did not know of each other we were going to iFLT and NTPRS! We talked for hours and that’s one of the nice thing of these conferences: meeting your colleagues and talking with them. 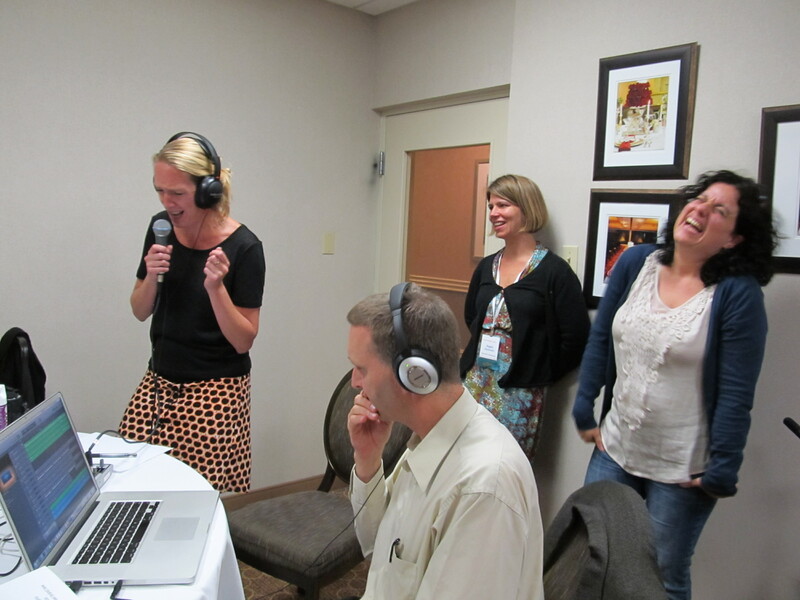 This morning at 8 o’clock started NTPRS14 in the Sheraton in Lisle, Illinois. We gathered in the ballroom and Lisa Reyes opened NTPRS14. Blaine did a few words and Lisa presented all the teams and all countries and US-regions had to stand up in order to show with how many they were. The big group from Turkey is also present at NTPRS. So there is one level more: the intermediate TPRS teachers. The advanced workshop has, unlike last year, one presenter and the intermediates also have one presenter, one of which is my roommate Michelle Kindt. The workshops are longer now: there’s a part in the morning and a part in the afternoon. I first went to the workshop by Carol Gaab: Reading, an advanced workshop. Carol’s workshops are always a delight to attend. They have a lot of variation, you learn a lot of interesting tips and tricks and they’re fun. I made a lot of notes and hope to use it all the coming schoolyear. See the link for her hand-out. During the lunch, Diana Noonan held her keynote speech. She told that she’s not the type for speeching and that she didn’t want to do it, but finally she gave in. She told us how she got into contact with TPRS and how she introduced it in her district. She started small, one teacher at a time. She invited a lot of TPRS presenters. The teachers can choose if they come to the professional or not. The next piece was assessment, because you have to prove that you are improving the students. They had funds and the teachers came together and started writing. They have the data: thousands of students did the tests. Diana filmed 9 teachers and put it on Schooltube. Teachers ahve to be able to observe each other. 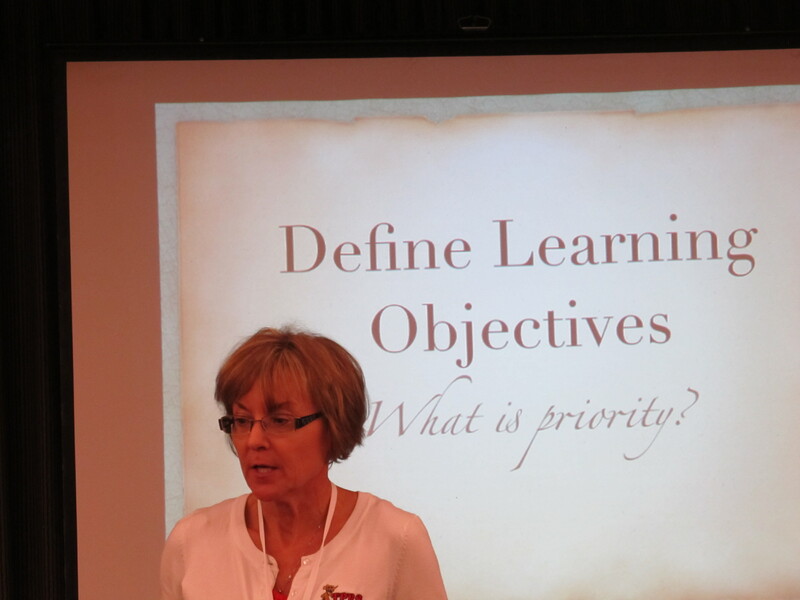 At the end Diana gave the message: Do what you know what is best for kids. If you meet roadblocks, remember (she finished with a cute video): “don’t stop, don’t give up, keep trying, keep trying (sung by of a cute little girl). After lunch Carol’s workshop continued and besides new tips and tricks she also gave us pages from TPRS novels in order to prepare a readers theater lesson. After Carol’s session I went to Gary DiBianca: Big picture planning: how to use CI to make meaningful; units filled with content and culture. He gave an overview of backward planning, how to reflect on personal and professional passions to engage students, how to present so that students acquire, learn and manipulate language. He gave the ACTFL 5 C’s: Communication, Connections, Culture, Community, Comparisons. He adviced to make cross connections within your lessons and units – do not isolate them. What’s your students base knowledge in and with the target language? 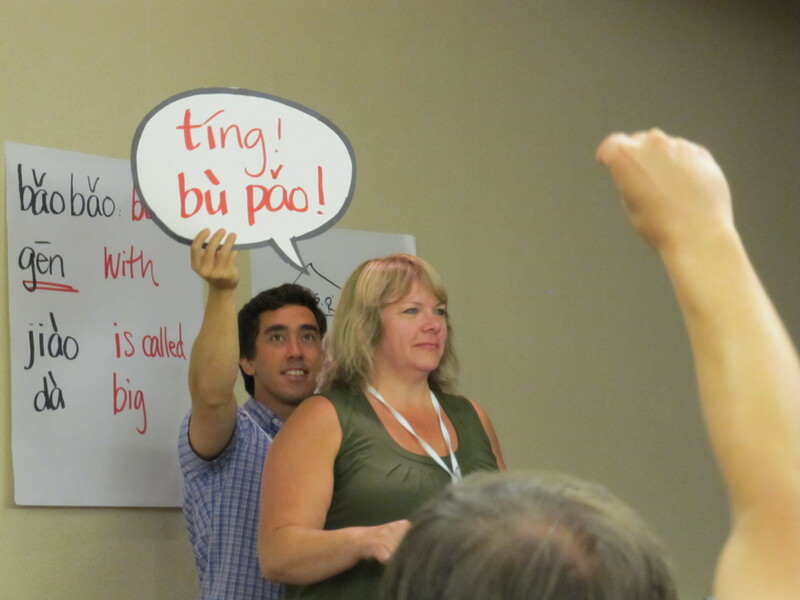 How do you adapt or retool your in-class target language usage? Is it all comprehensible? How do you organize instruction/content/language? What is your passion that you could share as a teacher? CONNECTIONS. Think about “Teach like a pirate” by Dave Burgess, who mentions 3 passions. My breakfast – and no, I don’t eat books for breakfast! Already back in the Netherlands and it’s only now that I have time and energy to continue to write about the last two days of NTPRS13. Thursday evening we had Openmic night and I went for a swim afterwards, because I really needed to have some physical exercice after sitting for so many hours the whole day and all those days and I also wanted to be outside. (The swimming pool is outside, on the 9th floor). Thursday the 25th I first went to ‘Reading Strategies for the Language Classroom’, although I also would have liked to go to Michael Miller’s “TPRS: the next steps“. You can find handouts of Carol’s workshop at the TPRS Publishing site, Freebies – Free downloads, Misc. Handouts, Novel Novel-activities. Grand Bryan A was packed ! Because guided reading can become boring, monotonous and predictable, Carol makes reading into a play, .e.g. by using 4 different colour groups and all groups get different tasks during the reading. She uses a laserpointer and it’s NOT just straight reading, but she shouts out colours and they have to perform, and not only going forward but also repeating, answering questions. She recommends to implement just one fun-technique per week and perhaps wait a while still using them with the lower levels. Carol told us again a lot about the sportguys she teaches English and with whom she uses a.o. these techniques; and who in fact mostly don’t like to read and don’t read. But this way they do! Carol puts signs in the text where she wants to ask personnal questions, context questions, cultural comparisons and connections. After the morning break I went to ‘Fast and easy speaking & writing assessments‘ by Scott Benedict. Scott has online workshops about assessment at his website Teach for June. He talked about ‘Group Speak'(TM) : small groups tell a story in front of the class, using only group-drawn pictures, using only known vocabulary, multiple sentences. He developed speaking rubrics, in order to assess the students individually. Students are familiar with these rubrics and they get them long before they are assessed, so there are no surprises for them. He always writes one positive comment on the rubrics and adds one goal for the next time. Scott also indicated that writing assessements are a pain to grade, but Scott’s secret: he uses the same rubrics as for the speaking assessments, only replacing ‘speaking’ by ‘writing’ and ‘speech’ by ‘spelling’. Scott has his students write every week and he starts with a 10′ timed writing and then it gets less in the year. Goal = 100 comprehensible words in 5′ or less (Scott arrives at it around spring break). Scott stresses the importance of positive feedback. Why are Team Speak (TM) and timed writing effective, according to Scott? After lunchtime again the choice for me between Micheal’s workshop and ‘Movie Talk‘ by Michele Whaley and Betsy Paskvan. The room was too small for their audience. Lot’s of us were even sitting on the floor! Movie Talk was started by Ashley Hastings with ESL students and it seems to be 5 times faster than traditional methods. I already used Movie Talk once with my CEF level A1 group (then last year’s beginners) and I used the price winning clip ‘Love recipe‘ of 5’ that Kristin Duncan put on her blog. The class and me talked for an hour about it! Lots and lots of PQA and lots to tell about the clip itself too. Betsy and Michele showed several clips; Michele did it the traditional Movie Talk way with Russian and Betsy showed a TPRS version in Japanese (which I found much more comprehensible; but if you can not use e.g. translation or even written words, then it should be more TPR-like, I suppose). At the end the showed us : the black hole (Kristin put it at her site too). Betsy and Michele asked us to make a Movie Talk lesson with this film, in groups. A great workshop, with a good combination of interesting and practical theory, good practice examples and hands-on for the participants. BRAVO Michele and Betsy! Because there happened to be not much news in it for me, I went to Carrie’s workshop but also to Señor Wooly’s. Being a French teacher there’s not in much in it or me unfortunately, but I like music and songs and I was very curious, because I read and heard so many positive things about him. And it was great! I’m jealous! Of course we French teachers have Alain Le Lait and he is wonderful, but Señor Wooly is even better! How creative! So much humor/humour! I also mentioned it before, I’m using a Multiple Intelligences scheme and that help’s me put in these resources in a really very simple way. It helps me addressing all 8 intelligences as mentioned by Howard Gardner and because of that addressing students ‘as a whole person’. Because TPRS also addresses students as individuals, a persons, as humans, MI and TPRS match very well! Today I even went to the coaching session, together with Joyce, also from the Netherlands. You can see how filled this day already was; and then the Open Mic night was yet to come! We went to a higher level station and we both observed someone teaching and being coached. Then the level changed to a lower level and we changed to a new station and there I asked Gary DiBianca to coach me when I would be teaching Dutch. Because ‘veryfying details’ is something new to me, I decided to be coached on that topic. I wrote a Dutch structure on the dry erasel paper and several words more, I picked an actor and off we went. Gary gave me good feedback afterwards and I was allowed to choose a small sticker to stick on my name tag. (He advised me a green one, which matched my clothing ;-). Because I work a lot with adults, I did not use actors a lot, because I thought they might feel slightly embarrassed by being an actor and being in the limelight. But every time when I’m being taught Russian or Japanese or Chinese or any other language I do not know, I always feel the strength of the visual part of actors, of seeing a story coming alive, in combination with hearing this language in a comprehensible way. I only went once to the coaching sessions, and that’s not because I think it’s not important, but because I was tired after all those sessions all day. And because there is little time to process everything you’ve heard, which also makes you forget easier. So I think it would be a good idea if the coaching could be immediately after the workshops and then anouther round of sessions after that. Or even be more integrated in the workshops, like in Von’s & Blaine’s veryfying details workshop or Betsy’s and Michele’s workshop. Before going to the Open Mic Night Joyce and I went to our favorite restaurant Zenna, (The Tai-Japanese one, where we went to the first night) and we happened to find there lots an lots of colleagues! And not only at this table, but everywhere!